Summer is almost upon us, and the debate about academic summer vs. summer of fun is on. 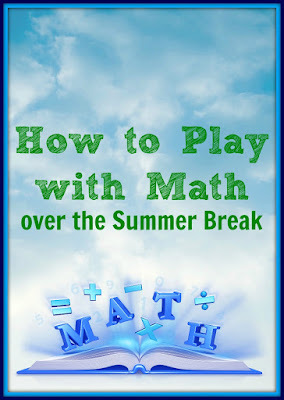 But sometimes academic can be fun, and today I am sharing how you can have some fun with math this summer. We tried different learning games over time, but the one that Smarty is always going back to is Prodigy. I am not surprised, because the game has the features that Smarty adores – a free choice of places to go to, mini games, and, most importantly, prizes to collect. It is built as any video game where you need to equip your character and where you level up occasionally and get more “health” for battles. So where is math? Math happens when you battle creatures of the world by answering math questions. The good part about the game is that you cannot die and you cannot kill anyone – the party that lost the battle simply runs away. You can also try to capture your opponent by first weakening it. It’s actually quite fun to watch Smarty play this game while simultaneously progressing fast in math. If she is stuck, there is a short explanation of the math concept and, eventually, an answer, but, of course, that counts against you in the battle. I also sometimes play the role of her "military adviser" explaining her more complex things (like operations with negative numbers). The game is “freemium” – you can do quite a bit for free, but paid membership offers certain perks in places one can visit and in prizes. So far Smarty played herself up from fourth grade math all the way to 6th and 7th grade math concepts (the game goes up to 8th grade), and she didn’t even notice that she is doing things that she was considering “too hard” before. I promised to get her a month of paid membership as “school is out” gift. I certainly recommend taking a look at Prodigy – perhaps your kids will take to it as eagerly as Smarty did. We love board games on Planet Smarty Pants. Check out the list of our favorites here. I am looking forward to playing them and many others this summer! While Prodigy is great, it’s still focused on computational math and using formulas. But I want my daughter to be able to solve word problems and be able to apply the right solutions to them. This is why we usually do a couple of problems right before bed as part of our time together. I use the best of our supplementary math books and “coach” her to the solutions when she is stuck. Smarty enjoys this approach, since she doesn’t feel like she has to solve these problems on her own and be “judged”. At the same time she is learning what I call “real math” – the one where you think outside of the box and apply your knowledge in real world. What are your views on summer math? If you do it, what is your method? More Math Ideas for Kids? Follow Natalie Planet Smarty Pants's board Math on Pinterest. We would love to have you link up your School-Age Post (Ages 5 and up) about your after school activities with kids age 5+ including Crafts, Activities, Playtime and Adventures. When linking up, please take a moment to comment on at least one post linked up before yours and grab our after school button to include a link on your post or site! By linking up you're giving permission for us to share on our After School Pinterest Board or feature on our After School Party in the upcoming weeks! Don't forget to follow along and join our After School Enrichment Google+ community. My kids love Prodigy, also. Thanks for introducing us to it! We're doing minute math in theory (they get a sheet of problems and see how many they can get done in 1 minute). Great ideas, I also like the program IXL to help keep the kids up on their math skills over the summer.